Cutting the branches back now the doves had flown the nest, we left the nest there and they re-visited their home daily. We watched their progress with great interest. 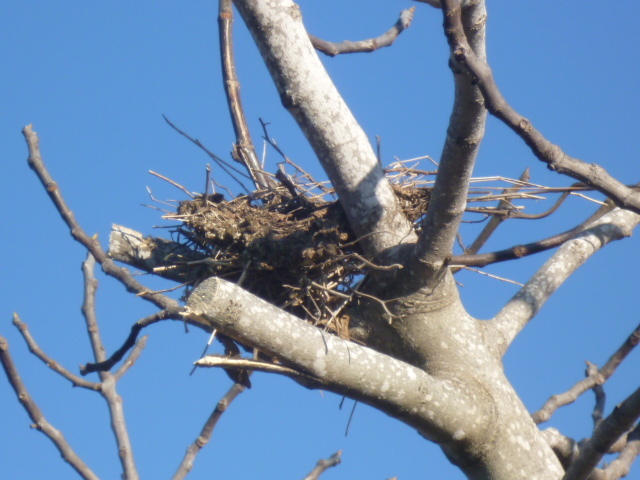 One day, having coffee on the terrace we saw what looked like the pair of doves flying around some conifers on our land, however what developed next proved otherwise. 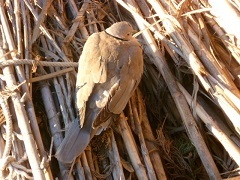 The dove fell to the ground from the midst of a conifer where it had fallen into it and then fell to the land. It had been targeted by a sparrow hawk and attacked but seemed to escape. Next as the bird lay there in deep shock, our puppy ran across and picked the dove up in her mouth and as we were shouting ‘drop ‘ and running to try to help the dove, our puppy dropped but then one of our older dogs grabbed her in its mouth and started running off with the dove firmly grasped. 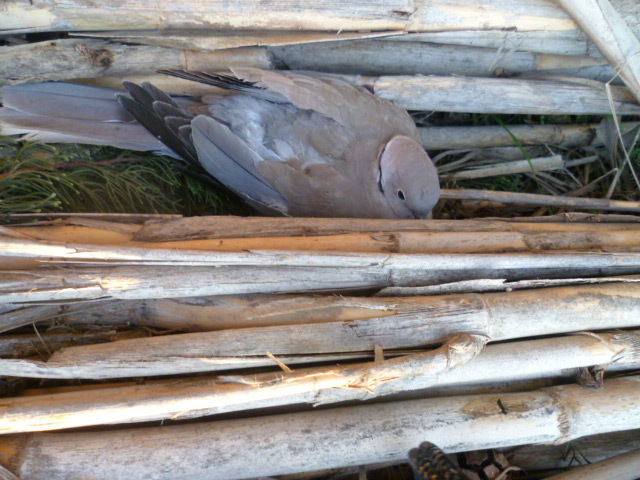 He dutifully dropped the dove as we got to him and the dove just lay there barely breathing and possibly injured. We got the dogs in the house to give the dove a chance to escape and she literally fluttered hardly able to fly into some bull rush reeds nearby. ‘I must be a strong dove because I have escaped that awful sparrow hawks attack..but he has to live too..it wasn’t personal..if I see him again, he will leave me alone because he will know I am too strong for him.. I was only a few minutes tapping and the doves’ heartbeat was definitely stronger but it was still on its back so I was also concerned for its safety. I left it for a few minutes warming in the morning sun. 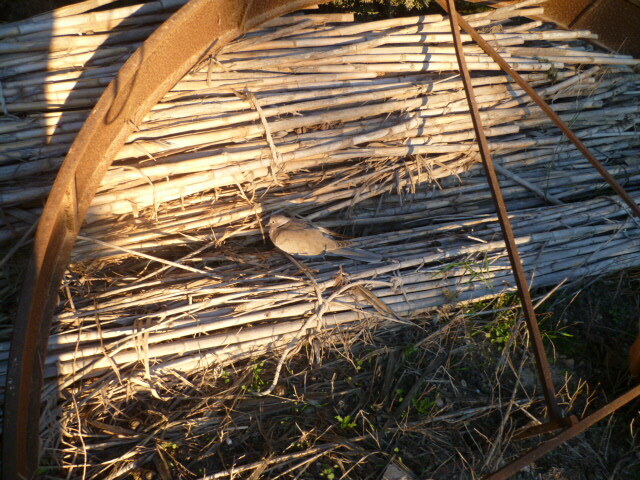 When I went back, I decided to try to help the dove turn into the right position from her back. As I moved forward very gently , she fluttered up a little and sat on the reeds in the sun. I tapped a couple of minutes more about getting stronger and flying away. I could see the bird didn’t appear to have been injured which was lucky considering being attacked by a sparrow hawk then picked up and dropped twice by two dogs. I left it again and went back a few minutes later and it had gone. I was hopeful it had recovered and flown away and couldn’t see any signs to the contrary. 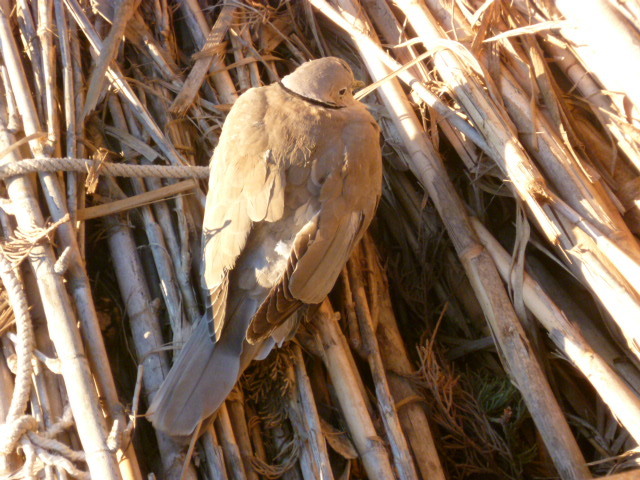 Later that day and every day since, the dove visits their nest in the now leafless fig tree . I have thought that yes maybe this would have happened anyway and the dove would have flown away without the use of tapping but my partner didn’t think it would survive and I didn’t and I felt better for trying to help and if it had been the birds last moments would the tapping have helped the transition?. Over the years and living in the country here, I have used EFT several times for injured birds and, an injured rabbit and a door mouse which have been in their last moments of shock and passing over but it does pose the interesting question , ‘does it help their passing ?’. I for one who loves animals, nature, wildlife and birds choose to believe EFT does help. In circumstances such as this EFT is so portable why not at least try to help our fellow animal friends, for we are all one energy. I believe we are intrinsically connected by this energetic field and that it is a missed opportunity for developing our humanity individually and collectively if we don’t try to help our fellow creatures. I have done much tapping with wild animals and our companion friends and even strays which was part of my evolvement to organise and bring together for the first time an Energy event for animals. There are 10 International speakers including Gary Craig live via Skype sharing our expertise, experiences and techniques on using EFT with animals, animal communication and their wellbeing. This unique event which I hope will be an annual one is on May 10th & 11th in Spain.